134/365(+1), a photo by Luca Rossini on Flickr. Time to fly back to Rome, I have some meetings to attend and a couple of topics to present at the BIOROB congress. I left the rest of the family in The Netherlands, since I’ll return there in a few days for the “10 years of the Advanced Concepts and looking ahead” at the European Space Agency. There I’ll meet with some other ex-colleagues from the time we lived in Leiden and, sure enough, there will be more parties. Together with the family, I’m leaving the cold, rainy, and grey weather of Northern Europe and I flying right into the hot, sunny and blue one of the South. 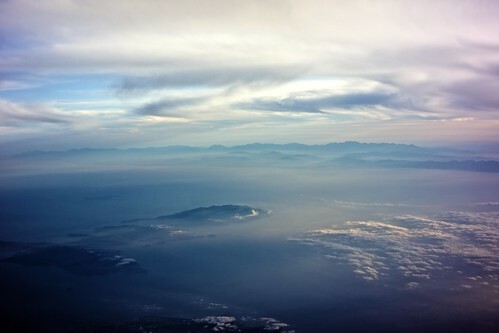 From the plane I get this nice view over the Elba island, a marvelous place in the sea of Tuscany. In the background is clearly visible the rocky silhouette of Corsica. The sea of Tuscany is the sea of my holidays since I was thirteen, so it’s quite powerful in putting me in the right mix of nostalgic, adventurous, and lazy mood of summer break. It’s power gets even stronger at sunset, when the Tyrrhenian sea offers incredible shows to who’s watching from the Italian coastline. I enjoyed this show so many times, even alone, with friends or, when I was lucky, with a lady friend, that I no simply get overwhelmed by it. So, our flight was delayed and now I’m happy, because thanks to the delay we’re now flying over the right spot at the right time. Summer is on, again.